Many of us dream that one day we might cast aside the pressure and demands of our day-to-day existence and seek a way of life that is purer, cleaner, simpler. And less secure. But you’ll have to want to very much, more than you want a secure job, a solid income after retirement, a big house, a smart car or two. For ten years Norma and I were dreamers of the night, quietly plotting and planning our escape. Then we joined the dreamers of the day. For the eight years that followed, and as recounted in summary in the above pages, cruising the world in a small sailing boat became our life. We sailed across the Pacific to Vancouver, round North America through Panama, over to Europe and the Mediterranean, to the Caribbean, French Polynesia and home. We lived on rent from the townhouse we had worked frantically to pay off before we left and, later, on the proceeds of two science books Michael wrote in Europe. We could present you a simple travelogue, a rosy picture of sundrenched harbours, lazy days on golden beaches, friendly natives dancing in the setting sun. Yes, postcard vignettes are there aplenty. But most of the time it isn’t like that at all. So, we’re going to try to paint you a more realistic picture of the time of our life that we spent, like Alice, in that strange world through the looking glass. Life on a boat splits into phases. There is the planning, the preparing, getting ready to go. Then there is the passage-making, the voyaging, the ocean-walloping – the dues you pay for the way of life that is cruising. The next phase takes in what most of us are out there for: extended time in a new country, the generally enviable life of a traveller who is able to take a floating home along. And combined with this third phase are the logistics – more planning, maintaining the boat, chasing mail, maybe making some money. Let’s now examine our experience, one phase at a time. Our boat is an 11.5-metre sloop named Cera. She was designed for us by a friend and professional colleague, a Melbourne University Professor of Mechanical Engineering and part-time yacht designer. We had the fibreglass hull built professionally, and did the rest ourselves: woodwork, plumbing, the engine, rig, sails, everything. Norma, a qualified sailmaker, made the sails and all the upholstery. 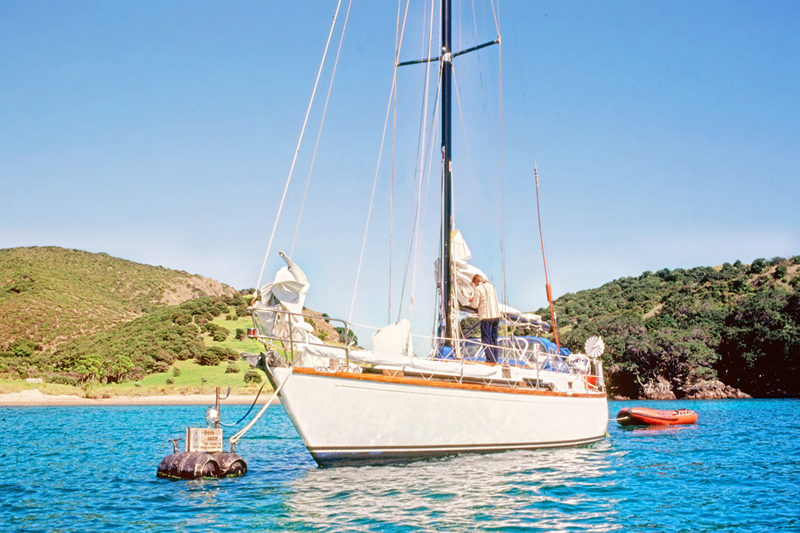 Before leaving for the Grand Voyage, we sailed Cera for five years in and around the Tasman Sea, racking up the miles and our oceangoing experience. Our vessel is no plaything. Away, our relationship was symbiotic: if we look after her, she will look after us. We tend her, mend her, feed her; she transports us, protects us, shelters us. She is our magic carpet. We have a far deeper feeling than that normally held by a “yachtsman” for his boat. Our Cera is a sentient being. We can tell when she is happy or unhappy, stressed or relaxed. But having a suitable vessel is only the start. Some – very few, fortunately – leap on their dream boat for distant shores wherever the wind takes them. Broke, wet and miserable, they limp back a year or two later, or less, the dreaming in tatters. Far more do like us. They plan. When the dreaming becomes serious, at some point it crosses an invisible barrier and becomes planning. The first step is to come to terms with nature’s obstacle course, the swing of the seasons, winter and summer in some parts of the world, cyclone seasons in others, monsoons. Get this part wrong, and a few months later you are stuck somewhere you want to leave, or have to sail away from somewhere you love before the season changes on you. Years slip by this way. We had such a good time in Central America that we missed the best time of the year for crossing the North Atlantic from west to east. That meant we had to wait a another year; so we went up the east coast of the United States instead, and spent a winter in the Bahamas. Mind you, that goes to show that slipping a year doesn’t mean it’s wasted; that was one of the happiest years of our lives. Charts, those indispensable maps of the seaways, have to be chosen from an immense catalogue of the world, ordered, bought, bartered, swopped, scrounged, traced and copied. They are a major expense. There are literally hundreds that cover a sea such as the Mediterranean. We stocked up for the Pacific pretty well before we left Australia, but once away it is often hard even to find anywhere to buy them. So, we often traded. Norma would mend sails, or I might receive a grateful chart after telling a worried sailor that there was not, as feared, anything seriously medically wrong. Yachts are usually moving in both directions; there was often a boat coming from where we wanted to go, a good time for trading and a splendid excuse for getting together. Once the boat’s in order, there’s us to be considered. Provisioning for months on end turns the boat into a floating supermarket. We never relied very much on tinned food because we have always tried to live very much as we do at home. However, especially in the less developed countries, we are forced to a fairly heavy reliance on so-called “dry goods”. These include rice, beans and so on, plus the makings for that staple essential – bread. Especially for the female half of two-person yacht crews, the way of life is very much a reversion to the days of her grandmother. Laundry has to be done by hand, water has to be collected from the sky, and bread must be baked every day. That is not necessarily true in ports, of course, but out at sea that is the way it is. While Norma is organising the provisioning and storage of food, before every long passage I will make a thorough check over the boat. There are no repair facilities in mid-ocean. I therefore peer and poke at every inch of the rigging, spars, sails, engine. Before leaving port, all the crew of a small boat are apprehensive. But experienced sailors will be fairly relaxed in their apprehension. They know that if the weather gets bad, sooner or later it will get good again. For inexperienced sailors in heavy weather it is easy to think that things will never ever improve, that they are doomed for ever more to be tossed mercilessly by the turbulent sea. At this point in the development of experience, sick, tired and miserable, some of the dreamers will give up further adventure in the face of brutal reality. Conrad said that the sea had no generosity. He wrote of the ocean’s “consciousless temper of the savage autocrat spoiled by much adulation”. Our philosophy has always been to sail from point to point very much on our own. This is becoming less common with the wide availability of powerful two-way radios. But we have never sought to make special efforts to tell people when and where we are going, to report our progress during the passage, or report to anyone when we have arrived (other than go through the normal hurdles of officialdom). This gives us total freedom to change our plans and destinations. We retain total “ownership” of the voyage. We have in fact several times changed our plans at short notice in order usually to avoid bad weather or make the most of good. We have never thus worried anybody by not arriving when we were supposed to. Others do find security in reporting their plans and positions regularly, but the security they feel is to a great extent – we believe – illusory. Once it is well away from coastal sea areas the chance of finding a small yacht in trouble, all by itself on the high seas, is exceedingly small. We believe that self-reliance and self-sufficiency are more likely to bring about a successful conclusion to a voyage than reliance on the help of others. We have never expected the nanny state to come and save us from the consequences of our own decisions. Once at sea the two of us (never have we sailed with other crew) settle into the ship’s routine. This includes a great deal of sleeping. The main difficulty for us in long-distance passagemaking is the need for one at a time of us to keep watch at night. That leads to a lot of catching up on sleep during the day. We are really only watching for ships, because any change in the wind or weather we can detect quickly from within the boat and we wake very easily if the motion or sounds change. Ships represent the most important threat to ocean-going yachts, and we know personally of two friends who have collided with ships in mid-ocean (and who lived to tell the tale). Keeping watch does not mean sitting up on deck the whole time. It means that every 15 minutes or so one of us leaves our cosy saloon to make a quick check all round the boat. A ship approaching on a collision course from the opposite direction will only take about 20 minutes to cover the distance between where it can first be seen and where we would hit. We never steer the boat at sea. We have an automatic self-steering apparatus which follows the wind, and which only needs occasional checking and minor adjustment. It is backed up by an electric autopilot. During the day, therefore, when not catching up on sleep we simply potter around doing basic maintenance, eating, reading and navigating. Our life continues, in other words, much as before. Navigational tasks only become heavy in coastal areas. Deep sea, a check once or twice a day on our position is all that is needed. When we started out, we were proficient at celestial navigation using a sextant to shoot the sun, moon, stars and planets. This is a highly elegant, traditional method, which gives great satisfaction. We can still do all that, but as on most ocean-going yachts we now have satellite navigation as well. This is so reliable and accurate that the old manual methods have been relegated to a cross check function. Boredom is a problem for most people at sea. We listen to music from a huge tape collection. We listen to news of the world and to current affairs on the radio; we have never been better informed. Reading helps the hours pass, and we settle into a book-a-day habit. We normally tow a fishing line unless it is too rough to easily recover any fish that blunders into the hook. Catching, recovering, cutting up and cooking a huge fish takes up the best part of a working day, and is a great antidote to boredom. It also feeds us for a long time. Norma pressure cooks and bottles what we can’t eat. In bad weather we gradually reduce the area of the sails so as to relieve the wind pressure on the yacht. In very rough and windy conditions some yachts “heave to”, which means that the boat is stopped dead in the water. This makes life surprisingly comfortable. When we are very tired we have sometimes done this for a rest from the ceaseless motion and to eat a meal in relative comfort. Generally, however, we prefer to press on, and the boat is just as happy to keep going. People do tend to ask about the dramas that we may have encountered. They are exceedingly few. We probably faced far fewer life-threatening situations in each year than a high-mileage vehicle driver in Australia. And sailing across an ocean is not half as scary as riding in third-world buses. One or two character-building situations do come to mind, nevertheless. When we crossed the Atlantic from west to east (from Bermuda to Ireland) we went a long way north because that is the “great circle” route and therefore the shortest round the globe. Up there, too, the westerly winds are at their most reliable. But those “fair” winds do get a touch strong at times. Early one morning we were picked up by a big wave and dumped unceremoniously on our side. Things flew everywhere, including Norma’s potted plants which had been carefully tucked away in the rear cabin which in port we use as a bedroom. There was no other damage that we could immediately see. However, we soon found that the self-steering vane was not working as well as we were accustomed to. Looking over the stern I saw that the auxiliary rudder for the vane was bent severely out of shape. It had to come off. To do that I clambered over the back of the boat suspended in my safety harness and attached to the vessel by two sturdy ropes. The rear of the yacht was pitching some up and down through some five metres, which made unbolting and removing the rudder of the self-steering gear not easy at all. I was also very cold, because I got regularly dunked in the icy waters of the North Atlantic. Later during the same long passage, in good conditions we were running before the wind under our brightly coloured spinnaker. Rolling in the big seas that had been left over from the gale, the spinnaker wrapped itself round one of the stays which holds up the mast. The only way to clear the wrap was for me to be winched to the very top of the 16-metre mast by Norma, so that I could undo the shackle holding the top of the sail. This was a highly exciting experience. The top of the mast was waving through a crazy arc of several metres, so that I needed two hands to hold on and the other two to undo the shackle and free the sail. Norma was dealing with the bottom of the sail, and I did suggest to her that she should take special care not to fall overboard at that particular point, as I did not want to continue to Ireland at the top of the mast, unable ever to get down without her help. Other experiences of concern have been around land rather than at sea. We left the Channel Islands one day in beautiful clear conditions, heading for the Brittany coast of France. We had waited for good conditions because every navigational book about the area suggested most strongly that the coast should never be approached in bad visibility. Well, sure enough, the fog clamped down and bad visibility was exactly what we had. It was more dangerous to return to the rocks and shoals of the Channel Islands than it was to continue. We therefore pressed on towards the rocks and shoals of the Brittany coast, swept by tidal streams that were moving faster than we were. We finally groped our way to a buoy marking the entrance to the river we wanted, and thankfully found a good harbour in a typical Brittany village. As usual, ten minutes later we had forgotten that we had ever been troubled. Approaching the harbour at Pago Pago in American Samoa, we saw other people having problems with wind and coral. There was a near gale blowing, and we watched in horror as a large Taiwanese fishing ship right in front of us lost all power at the entrance to the harbour. She ended up high and dry on the coral reef. The crew shot flares but there was very little that we in a very small yacht could do for them. They were later pulled off the reef by a tug, but the ship sank in Pago harbour an hour or two later, just across the way from us. I think most arriving crews feel something like that. Especially after the first ocean crossing, a sailor feels he or she can take on the world. However, the fact that most of a sailor’s contacts in this life have done the same sort of thing, and most of them more often, can be dampening. For many Americans their first ocean crossing takes them to the islands of the Azores, where there is a popular yachtsmens’ bar. Many have spoken of the experience of walking into this bar and saying “Wow! I have just crossed the Atlantic!” Yes, well, so has everyone else there. The worst thing about arriving in a new country is that we enter once again into the real world of bureaucrats and officialdom. The Spanish-speaking countries (and, I must say, Australia) have a rightfully well earned reputation for officialdom. It is always difficult to accept being regarded prima facie as a drug-running hippie, when arriving at the same country by air means a friendly smile and a wave through the formalities. Basically, yachts are treated like ships: forms have to be completed by port officials, customs, health workers, agriculture inspectors, the lot; and sometimes, at every port in the country. In Mexico, all the forms had to be taken to all the offices to be signed by all the officials. This leads to anarchic feelings among the most law-abiding, and in the unlikely event that we return to the splendid country of Venezuela, and in the equally unlikely event that they keep records, they will find that we never officially moved from the port we first entered. Sometimes the attitude of the officials colours our whole view of a country. This of course is grossly unfair on the vast majority of its happy and friendly citizens. In any event, encounters with officials often have their funny side. When we first arrived in Honduras, because we had some problem with the propeller we had to enter the harbour under sail and anchor off the wharf. Now, in some countries they insist that you anchor off and then come ashore to clear with the officials; some insist that you anchor off and stay put until visited; and some insist that you come alongside the wharf, otherwise the officials will have nothing to do with you. In the Galapagos islands the Port Captain of one of the only ports that yachts are normally permitted to visit had a stranglehold on the diesel supply. Officially, because yachts are not supposed to stay in the islands for more than 72 hours, no diesel fuel can be sold to them. However, it appeared that a special deal could be struck with the Port Captain, who just happened to be a naval officer. Naturally, the only supplies of diesel fuel in the islands came through the navy. As it happened we left our fuel containers for several days in the Port Captain’s office waiting for them to be filled with naval diesel, but that never happened, and we were finally given some by a friendly visiting tuna fishing boat. An easy way round many of the problems of officialdom in the third world is to throw money, which is clearly what many expect. However, most cruising sailors are very reluctant to join this game, and in fact we never really bribed any officials the whole time we were away. There was one exception. In a pretty little harbour in remote southern Mexico, where we were waiting for gales to cease before we left, we overstayed our Mexican visa. The village general-purpose official – who also ran a beachfront “palapa” or palm-frond bar – put on his uniform white shirt and told us that we would have to pay port fees if we stayed any longer. Otherwise, he threatened, he would report to his head office in Acapulco that we were illegally overstaying our permitted stay in the country. This whole matter was amicably settled over a beer and the exchange of a five-dollar bill for “port fees”. While it is easy to think of the cruising life as a series of long periods at sea, in fact as a proportion of the total time away we spent a comparatively short time (about 20%) sailing. Most of the time we were day tripping down a coast or anchored in a pleasant harbour somewhere. Because other yachts are doing the same thing this becomes a very sociable enterprise. We made more new friends during the time we were away than in a lifetime ashore. If there were, say, half a dozen yachts in an anchorage, within two or three days everyone would know everyone else. In the more crowded areas such as the Caribbean and Mediterranean, the chance of making new friends was paradoxically lower because there were simply so many people. However, because we try to avoid the more crowded areas and seek peaceful anchorages rather than crowded harbours and marinas, we often linked up with similarly independent souls, and many of them became lifetime friends. One of the whole points of this whole exercise was of course to enjoy life ashore, and as relaxed travellers at far greater leisure than a “tourist”. Inevitably, we came to an enjoyable appreciation of the local customs and the way of life of the people. This we did particularly in countries such as Fiji, Tonga, Turkey and and Central America. We especially remember the country of Panama, where for several weeks we cruised the almost deserted Chiriqui coast between the border of Costa Rica and the Canal. We asked a young man from a village whether he often saw yachts in the area. He answered “Oh yes – why, there was one here only three months ago”. Some experiences are unique to yacht cruising. In Penrhyn Island, for example, in the remotest part of the central Pacific, there is a feast of traditional island singing during the period between Christmas and New Year. It is virtually impossible to get to this island except by private yacht. Crews from the two or three yachts that were there with us at the time were uniquely favoured by being asked to this festival of song. We were thus able to share in an experience which very few in the world can possibly do, as Penrhyn villagers are famed throughout the Pacific for their singing. In paradisical Fanning Island, one of the Line Islands in the Pacific about 1000 miles south of Hawaii, we were asked to the wedding of local people, family of the customs official for the day we arrived whose leg I had treated for an infected coral cut. Honoured guests, we had to make a speech of appreciation and tender a simple gift. We joined the feast of roast and mashed taro, roast and stewed pork, fish wrapped in banana leaves, breadfruit, candied pandanus, and rice. We ate with our fingers from platters woven from palm fronds. A special treat was “camp pie” from a tin, a true luxury. We joined the dancing, relishing the lewd gestures of the old women, now the only ones permitted on such a special occasion to depart from the prudish behaviour that early missionaries left as their bequest. Now, the whole extraordinary experience – our very existence for a large part of our life – is becoming veiled in mists of passing time, like a vivid dream that was recently so real, yet now needs chasing down dark corridors of memory. But our recall is good, once triggered, and re-reading our logs and diaries, and talking about it all with the few other cruisers we see, brings back that looking-glass fantasy world, where highs are so high and lows so low, and not everything is quite what it seems. It’s such an intense life out there. Once you’ve been scared, you know what it’s like to be truly relieved; once really wet, you know what a joy it is to be dry. We sorely miss our mass of new friends, many seen just once yet made for life. We miss leaving harbours with only a blue horizon ahead, the thrill as we approach a new country, see new people, and scanning the first anchorage for those we know who have shared our experience. We don’t miss constant, underlying concerns about the weather, money, mail, officialdom, and other people dragging anchor. We don’t miss third-world food, or carrying the shopping for miles along hot, dusty streets. And it’s good to have a car, to live in a home that won’t blow away in a storm, to have hot running water in a tap, to have ample electricity at the flick of a switch, libraries down the road. As a gentle reminder of what we are missing, our beautiful Cera is securely moored in sight of the house, still ready to sail away, any time, anywhere. Our magic carpet is dormant, but destined never to be completely at rest. My final message to you is that the dream can be realised, even by those who are not the “adventurers” you read about. Anyone can join Alice, and us, through the looking glass.